A view down North Fifth Street in Northern Liberties. A main thoroughfare that runs through Northern Liberties has gotten temporary speed cushions as part of a traffic safety study. The Philadelphia Streets Department announced Friday that four cushions would be installed on North Fifth Street between Girard and Fairmount avenues. The devices, made completely of recycled rubber, have resulted in reduced traffic speeds of about 15 mph in other areas of the city, according to the department. The pilot study will run into the spring of 2017 and is part of several studies conducted on traffic that runs through North Fifth and Fourth streets. 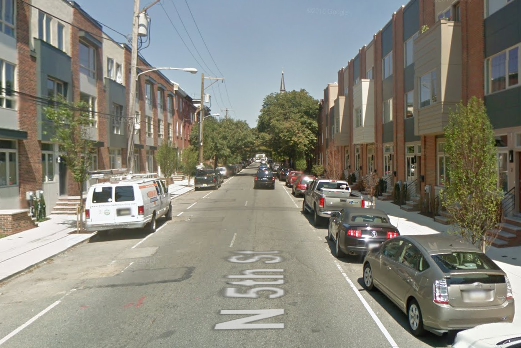 In March, residents raised concerns to city officials about drivers running stop signs and speeding down the road at a community meeting, PlanPhilly reported. The streets department thanked the community for its input in announcing the installation of the cushions and asked for patience while implementing the safety measures.